As Remembrance Day draws ever closer, taking place on Sunday, the poppy debate has reared its head again and this time a man wearing a white poppy on This Morning has been blasted. Some people seem to think that wearing the red poppy at this year glorifies war, as opposed to paying tribute to those who died, and new research indicates that a third of under 25 year-olds will not be wearing a poppy this year for that same reason. And the debate has come to the surface once again as one man visited the This Morning studios to discuss and explain why he wears a white poppy, as opposed to a red poppy. Adam Spiers went onto the ITV daytime show to discuss and explain his views, and he said that he would be more willing to wear a red poppy if the British Leigon weren’t so “problematic”. Speaking to presenters Holly Willoughby and Phillip Schofield, Adam said: “[The British Legion] accept sponsorship from a number of arms manufacturers and in 2012 their president needed to resign. However, all of the presenters on This Morning – all of whom were wearing the traditional red poppies – disagreed with Adam’s views. “You can’t criticise a young man for wanting to be in the military,” said the former soldier John Nichol. When asked if he found the white poppy offensive, John said: “I would fight to the death for Adam to wear his white poppy. 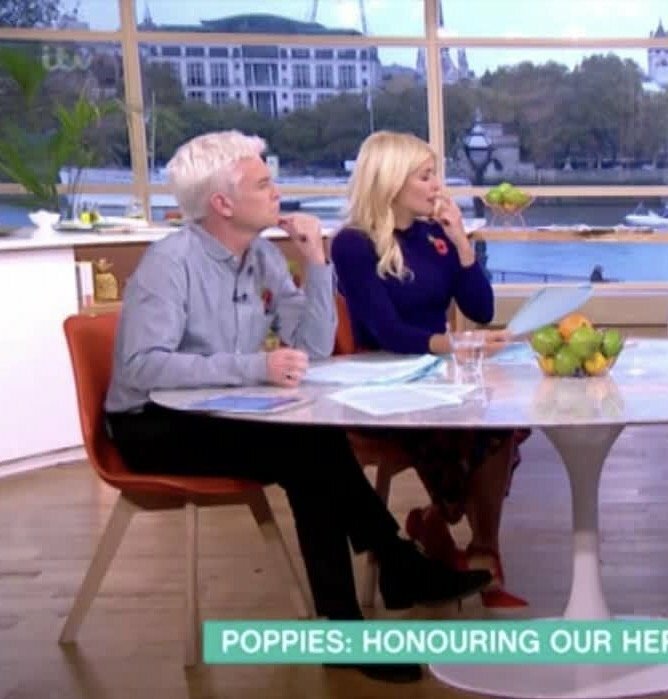 There has been a lot of debate over the wearing of poppies recently, and Holly was in the news herself recently because of the manner in which she wore her poppy during yesterday’s show. Appearing alongside her co-host Phillip Schofield, the Celebrity Juice star was wearing a poppy pinned onto her outfit, however some fans called out the presenter for not wearing the poppy correctly, with the poppy on the wrong side and the green leaf pointing in the wrong direction. But, as with the case of Adam and his white poppy, the British Leigon themselves said that how one wears the poppy is pretty much irrelevant, so long as it is being worn for the right reasons, as they said: “There is no right or wrong way to wear a poppy. It is a matter of personal choice whether an individual chooses to wear a poppy and also how they choose to wear it. While a lot of people do think that the red poppy already encompasses all of the sentiments that are encompassed by Remembrance Day, it is all a matter of opinion, so long as the poppy, red or white, is worn to pay tribute to all of those who have died in war, British or otherwise.